Congratulations to the Robot Art Contest Winner Andrew Chase and his Articulated Robotic Gorilla! July at Stan Winston School was full of amazing mechanical characters, including CatBots, ArachnoBots, Nano-Disarticutators and even a Giant Happy Carnival Mech... of DOOM. 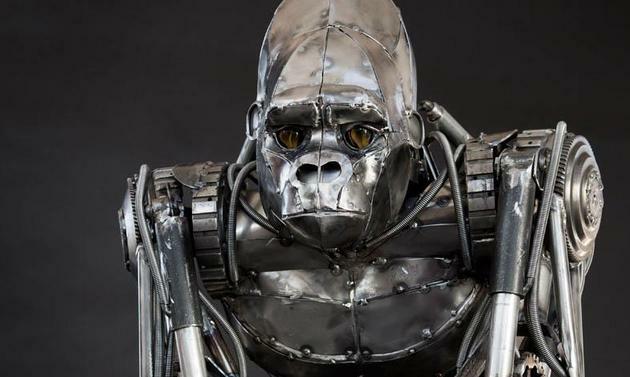 BEHOLD THE ARTICULATED ROBOTIC GORILLA BY ANDREW CHASE! THE PLANET OF THE MECHANICAL APES ANYONE? According to Andrew, his all-metal, fully-articulated gorilla sculpture is "roughly four feet tall standing upright and weighs around 100lbs." The only thing missing is a simian propulsion system to make this big guy swing for real. To show the posability of this formidable figure, Andrew created a "herky jerky stop motion animation of him brachiating across a ladder." Check it out below. Screen-Used Terminator Salvation T-700 Endoskull!